(Newser) – Are burgers on the menu? 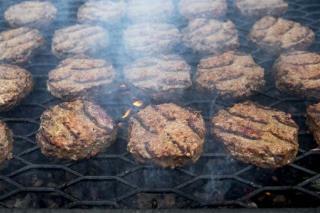 You may want to take a look at the Hamburger Report before you fire up the grill. The report found unexpected ingredients in some of the burgers it tested—including the DNA of rats and humans—and some missing ingredients in others, such as the mysterious absence of black beans in a black bean burger, KHOU reports. Clear Labs tested 258 samples—ground beef, frozen patties, fast food burger products, and veggie burgers—from 79 brands and 22 retailers (they are keeping the sample info anonymous). Of all the samples, 13.6% had discrepancies between the label and the product. For vegetarian products alone, however, that figure was 23.6%. The study authors found "surprising quality issues, signaling that there are gaps in food safety and quality protocols that should be addressed." Some 6.6% of samples had some form of substitution, such as the inclusion of beef, chicken, turkey, pork, rye, or sunchoke in products that were not supposed to contain those ingredients. Some 1.6% of the products had hygienic issues, with rat DNA found in three and human DNA (likely hair, skin, or fingernail introduced during the manufacturing process) found in one. From the authors: "It's important to note that it is unlikely that human DNA or rat DNA is harmful." 4.3% of the tested products contained pathogenic DNA, with vegetarian products account for four out of 11 of those. And that, the authors say, is "troubling, especially so in vegetarian products, which is widely considered a lower-risk food category." Hey you poor slaves. It's the Rich here. We and our jew friends are gonna tell you that we're feeding you trash, rats, and people; but we're not gonna say who did it. That's right, we're telling you that your worthless, human trash to be used for labor, and then for income when you spend all your money fighting cancer in your late years. Thanks for your cooperation. The names of retailers should be told.We have a right to know!